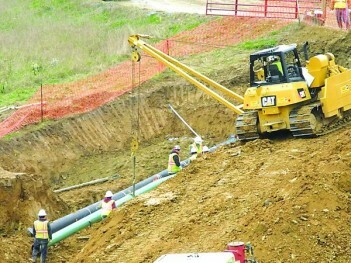 As West Virginia produces more natural gas, there will also be a need for more pipelines to move the fuel through the state. WHEELING, W.Va. — West Virginia University researchers expect shale horizontal drilling and fracking to help the state produce about 500 billion cubic feet of natural gas per year by 2020 – up from the less than 100 billion produced in 2008. At the same time, Deskins expects Mountain State coal yields soon will level off at about 100 million tons per year – down from more than 160 million tons produced in 2008. Last week, longtime coal producer Consol Energy announced that it reached an all-time company record for natural gas production – on the same day it agreed to sell an Illinois coal mine to Murray Energy. In 2013, Murray paid $3.5 billion to buy five former Consol mines, including the Marshall County facilities formerly known as McElroy and Shoemaker. Consol’s Utica Shale production from July 1 through Sept. 30 was 34 times greater than in the same period in 2013, while the Marcellus Shale yields grew 76 percent year-over-year. Via its CNX Gas Corp. subsidiary, as well as joint ventures with both Noble Energy and Hess Corp., Consol is becoming a significant player in the shale game. Overall, the Canonsburg, Pa.-based company produced 64.9 billion cubic feet of natural gas from July through September, reflecting a 41-percent increase from the 46.1 billion cubic feet it pumped over the corresponding three months in 2013. Of this amount, 30.7 Bcf consisted of Marcellus gas, with another 6.8 Bcf drawn from the Utica formation. “Our record gas production in the third quarter represents sequential growth of 25 percent, which is the largest in company history,” Consol President and CEO Nicholas J. DeIuliis said. Deskins said there are numerous reasons for companies to shift their focus from coal to natural gas, including natural gas is generally more acceptable from an environmental regulatory standpoint, and natural gas production is not as “labor-intensive” as coal mining. For example, a coal mine needs a relatively high number of workers to continue running machinery during the production phase. One a natural gas well enters its production phase, the company needs relatively few workers to maintain the well. Although coal production is down throughout West Virginia, research by Deskins and his team shows the decline is steeper in the southern portion of the state. Southern West Virginia miners produced about 125 million tons of coal in 2002, but are projected to only yield about 70 million tons this year. Northern West Virginia coal production, meanwhile, has ranged from about 38 million tons per year in 2001 to about 45 million tons this year, according to Deskins’ information. To read more from The Intelligencer/Wheeling News-Register, subscribe here.